How to setup G Suite provide us cloud based online services to you or your company with new methods of Google.Domain name has configure with GSuit set Mail Server.Gmail providing you cheap rate mail services.It includes video conferences,using email,document,slide,sheets,chat and many other things. You have to sign up first and then enter your domain name to start services. All customers can get them free and have many other additional features. As Google data center it save your information and you can use it for other purpose like synchronize or backup.It is more beneficial for individual and small scale business so that they can just share the significant information to others. Neat Gmail :- Mails are important part in work and use hot mail,gmail and they use address.G Suite use your company domain name and it makes you more professional. It is consider as your online address.From many years it is best service provider than other site.No doubt it save your time and have access to move or delete file with just single click. You can manage shortcut by go to general tab and then select short cut keyboard. If there are Many unwanted messages then select Archive button. Cloud Storage :- Other source provide you limited space but here you have no issue related with space. It use Google cloud for storage. Google Search With Cloud :- Company data is stored any of employee can be easily accessible to all. There is no single chance to lost data as it is saved. Helpful In Sync :- It is easy if you want to use on other devices such as mobile,tablet,and computer. As it has function of using IMAP store your data which help to move it on other gadgets. Slides And Forms :- Project need slide show,power point,registration, forms,and jobs application can design here. Google Drive:- Amazing place where individual can manufacture folders according to his choice. When person finished here they have power to move it according to need as in phone or desktop. More Reliable :- For any company and person emails are essential part and need for long time. Most Of hosted companies remove them when you left their hosting but you need not to worries. It help you to work offline too. 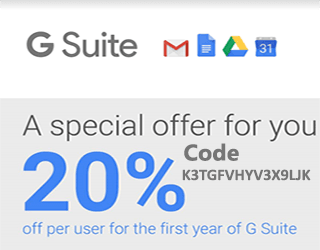 First of all you need to sign up on G Suite page to have free trial. As for first month you can enjoy it free. Then in next step you enter all required details in page.On next path choose domain if you already have then click on have domain or select second option. After that create user name for G Suite and must use that name which is you more like to use for your email. It should notice that some of email name ensure you for low cost. You redirect on admin dashboard when you click on sign up button. You can check in pictures that given below. First and foremost thing is to verify ownership with many ways but it is easy by meta tag and TXT record assets you for it. Now you are near to set up email for domain you have after verification process. Now you need to go back for set up your services with G Suite. It has quality that any non technical individual can set up it with short of time. It give you instruction for quickly set up. After all this delete exiting record of other hosting services. Google will take 24 hours to check MX record and activate your services. I believe that these steps will help you to set up your address for email.